This is the fate of many Old Florida homesteads. 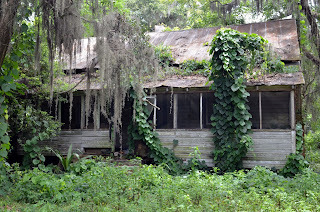 They are abandoned and slowly succumb to rot, insects and being overtaken by the relentless growth found here in Florida. I love these photos almost as much as a good old Florida summer thunderstorm. thank you. Those thunderstorms are awesome. I truly feel evaluating white and black photography with it's film counterpart is similar to comparing apples with grapefruits. They simply are not the same in look and feel. I discussed this in detail partly 1 of this range. Check Out Your URL When speaking to professional photographer Hellen Van Meene she explain movie as possessing "secret". Now I'm not sure exactly what the techical phrase for wonder is but artistically I realize exactly what Hellen indicates.